Hello! It's been literal weeks since I've posted - I'm still alive, I promise! December has been a bit of a manic month for me with work, interviews and appointments for new jobs, Christmas shopping and a load of family stuff, so I've just not had chance to post all the things I was hoping to throughout the month. Still, onwards and upwards, hey!? I'm back now and I thought it'd be nice to share the few bits and pieces I've picked up in the sales, although I've been pretty restrained this year (admittedly through financial necessity more than anything else...)! I have a Body Shop gift card but I completely forgot to take it into town with me today! You can't use gift cards online which is SUCH a pain in the bum!! You got some lovely bits, I love the body butters! I think I'm going to get myself one when I eventually use my gift card. You picked up some fab bargains! I feel like I need to head over to The Body Shop & Origins to pick up some goodies but I have probably missed all of the good offers. I didn't pay any attention this year! Great buys! I haven't got anything in the sale yet. 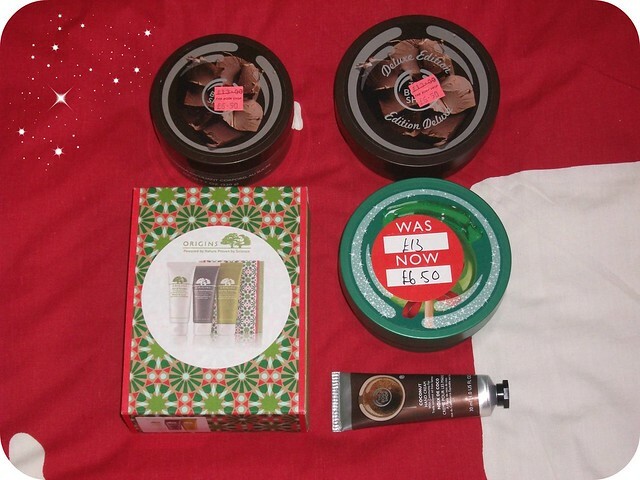 I couldn't resist a few things though - I didn't get the glazed apple body butter but did get the matching bath jelly!